Adjustments are done via a locking nut. 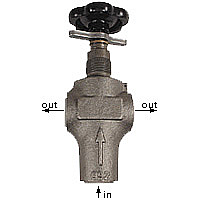 Version: Seat valve with attenuation. Adjustments are done via a hand wheel. 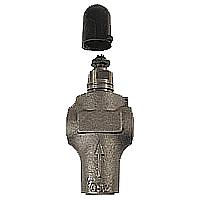 Bauart: Seat valve with attenuation. Max. leakage oil flow: 1 cm3/min. 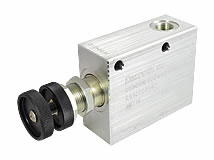 This valve is composed of two direktly operated pressure relief cartridges. It is recommended for continous use or as overpressure valve. Installation as close as possible to the power drive. It lowers the pressure at the primary system directly to a lower, constant pressure at the secondary system. Secondary pressure is independent of pressure changes at the primary system. 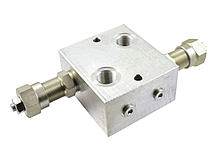 The valve acts as pressure relief valve in case of increased pressure at the secondary system. Free flow from Reg to P is possible due to the integrated valve . Leakage: approx. 0,19 l/min at max. pressure from connection Reg to R.